Microvascular angina (MVA), i.e. angina caused by abnormalities of the coronary microcirculation, is increasingly recognised in clinical practice. The pathogenetic mechanisms of MVA are heterogeneous and may involve both structural and functional alterations of coronary microcirculation, and functional abnormalities may variably involve an impairment of coronary microvascular dilatation and an increased microvascular constrictor activity. Both invasive and non-invasive diagnostic tools exist to identify patients with MVA in clinical practice. Prognosis has been reported to be good in primary MVA patients, although the prognostic implications of coronary microvascular dysfunction (CMVD) in more heterogeneous populations of angina patients need further assessment. Management of primary MVA can be challenging, but pharmacological and non-pharmacological treatments exist that allow satisfactory control of symptoms in most patients. In clinical practice, a coronary microvascular origin of typical chest pain symptoms is usually suspected, by exclusion, in patients with angina, typical ischaemic changes on the ECG and/or abnormal findings on non-invasive imaging stress tests, in whom coronary arteriography fails to show obstructive CAD or epicardial coronary artery spasm. This review briefly addresses the clinical presentation, mechanisms and management of patients with chronic primary stable MVA. In MVA patients exercise- and/or stress-induced angina, tends to be longer lasting with a slower resolution (>10–15 min) of chest pain after stopping exercise, and/or following the administration of short-acting nitrates, compared with anginal episodes in CAD patients.8–10 These findings are particularly suggestive of MVA when occurring in peri- or post-menopausal women. Female gender is largely prevalent among patients with primary stable MVA, a finding that has suggested a role for oestrogen deficiency in the pathogenesis of MVA in women.11 When positive for myocardial ischaemia, an ECG exercise stress test is usually unhelpful to distinguish between patients with obstructive CAD versus CMVD. In some MVA patients, both the early appearance of ECG abnormalities and/or angina during the stress test and the lack of response to sublingual nitrate administration often suggests a microvascular origin of symptoms. Myocardial perfusion scintigraphy stress testing is often unhelpful for identifying patients with angina related to obstructive CAD versus CMVD. A negative perfusion test or the occurrence of patchy perfusion abnormalities in the presence of typical effort-induced angina may suggest MVA rather than obstructive CAD, but negative findings sometimes occur in the presence of multivessel obstructive CAD. As mentioned above, the occurrence of angina and ST-segment depression, but not LV contractile abnormalities, during echocardiographic dipyridamole or dobutamine stress testing, is suggestive of a microvascular origin of symptoms.12,13 Newer echocardiographic modalities, however, are nowadays more able to detect LV contractile abnormalities in MVA patients. A definitive diagnosis of MVA, as also proposed by the COVADIS group,4 requires the demonstration of CMVD. Coronary microvascular function can be examined by both invasive and non-invasive methods.14 The most widely used invasive method for the evaluation of coronary microvascular function is the recording of coronary blood flow velocity using an intracoronary Doppler wire coupled with a pressure/thermodilution device to allow measurements of both blood flow and coronary microvascular resistance. Among the most reliable and accurate methods for non-invasive assessment of CMVD is positron emission tomography (PET).15 However, its reduced availability in clinical practice and high cost preclude a wider applicability for routine assessment of MVA patients. Cardiovascular magnetic resonance (CMR) imaging, with gadolinium as a flow tracer, is also a very promising tool for the non-invasive assessment of CMVD.16,17 Contrast stress echocardiography is another valuable method for the assessment of CMVD in different myocardial territories;18 it is more widely available and less expensive than other methods for coronary blood flow (CBF) assessment. Although more work is required to fine tune this technique, transthoracic echocardiographic Doppler recording (TTDE), has been shown to be a reliable and accurate methodology.14 This technique, however, is operator-dependent, and limitations also include suboptimal chest windows in some patients and interobserver variability. When assessed, CMVD tests should explore both vasodilator and vasoconstrictor responses of the coronary microcirculation (Figure 1). Coronary microvascular dilator function is investigated by measuring coronary blood flow changes and/or resistance in response to vasodilator stimuli, i.e. adenosine injection, and to constrictor stimuli such as ergonovine or acetylcholine (ACh). Importantly, both endothelium-independent and endothelium-dependent coronary microvascular dilatation should be assessed. Of importance, coronary microvascular spasm can only be assessed during coronary angiography. While ACh is currently the preferred provocative stimulus for coronary microvascular spasm, ergonovine might be a valid alternative (Figure 1). Other studies have shown abnormal constrictor responses of the coronary microcirculation in primary MVA patients, i.e. coronary microvascular spasm.19,27–28 In the 1980s Cannon and Epstein showed for the first time that the administration of ergonovine further impaired the abnormal coronary blood flow responses to atrial pacing in patients with angina despite angiographically normal coronary arteries.25 They proposed the term ‘microvascular angina’ to define these patients. In clinical practice, markers of a possible role of coronary microvascular constriction in MVA include the occurrence of slow coronary blood flow at diagnostic angiography,29 the detection of increased circulating levels of endothelin-1 – the ‘strongest endogenous’ vasoconstrictor stimulus identified to date – both at baseline and after atrial pacing,30 and the occurrence of angina at rest as the prevailing clinical presentation. Furthermore, recent systematic assessment of intracoronary ACh testing in the cath lab in patients presenting with angina despite angiographically normal coronary arteries has shown coronary microvascular spasm in at least 25 % of these patients.19 Notably, a sizeable proportion of MVA patients has also been found to develop epicardial spasm, suggesting a possible contribution of this mechanism to the angina symptoms in at least some MVA patients. Prognosis in primary stable MVA patients showing completely normal coronary arteries has consistently been reported to be good, with rates of major cardiovascular events (i.e. death or acute myocardial infarction) that appear to be similar to those found in the general population. 9,10,34 Larger studies, however, have recently challenged the view that MVA carries a good long-term prognosis.35 These studies, however, included more heterogenous groups of patients, with potential markers of worse outcome, including subcritical coronary atherosclerosis, impaired LV function and arrhythmias. Quality of life is, on the other hand, negatively affected by MVA, with many patients needing to retire from work at an early age and restrict their social activities dramatically. Treatment of MVA includes full control of cardiovascular risk factors and all other conditions that might impair clinical outcomes (i.e. inflammatory status, oestrogen deficiency, high adrenergic activity). 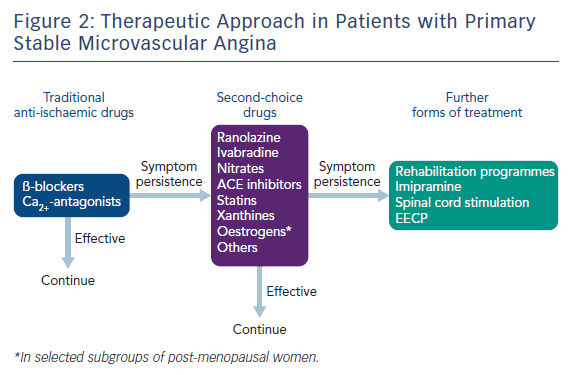 Given the problematic nature of symptoms in these patients, a specific goal in the treatment of stable MVA patients is to reduce angina symptoms and improve quality of life (Figure 2). Symptomatic outcome seems favourable in primary stable MVA patients when pharmacological and non-pharmacological interventions are systematically applied. However, although a sizeable proportion of patients show a significant reduction of symptoms over time,34 some patients report worsening of angina during follow-up, which can be related to a progression of their CMVD, worsening of enhanced pain perception or exacerbation of microvascular spasm. Although conventional antianginals are considered to represent first line treatment for myocardial ischaemia and chest pain in MVA, they are not effective in many patients. A pathophysiologically based approach should be preferred over a ‘first line’ and ‘second line’ recommendation. Identifying the prevailing mechanism for MVA in every individual may help the treating physician decide whether they should try to affect myocardial oxygen demand, microvascular spam or abnormal vasodilation, or all three. Overall, beta-blockers have been shown to improve angina symptoms, particularly in MVA patients with effort-induced angina and evidence of increased adrenergic activity, e.g. high heart rate at rest and/or rapid increase of heart rate on effort.36 Ivabradine – a bradycardia-inducing drug – may be a suitable alternative option in these patients, albeit no large studies have been conducted in this clinical setting with this agent. Non-dihydropyridine calcium-channel blockers such as diltiazem, are expected to be effective in patients with angina at rest, often triggered by microvascular spasm. Oral nitrates do not appear to be effective in MVA but nicorandil, a potassium channel opener with nitrate-like actions, has been suggested in some studies to have beneficial effects in patients with MVA.37 Promising data have also been reported with the use of ranolazine,38 a recently introduced antianginal drug that acts by reducing the late sodium current in the myocardium, which results in improved diastolic relaxation during and after ischaemia. Microvascular angina is being increasingly recognised in clinical practice. The condition affects a larger proportion of individuals than initially thought and, although there is an increased prevalence of MVA in menopausal women, the condition is by no means one that affects women only. CMVD, presenting as abnormal coronary microvascular dilation, microvascular spasm, or both, is the pathogenic mechanism underlying MVA. Both invasive and non-invasive diagnostic tools exist in clinical practice that help identify patients affected by MVA. Prognosis has been reported to be good in patients with MVA in the absence of conditions known to be associated with increased risk. Recent large studies, however, have reported prognosis to be impaired in more heterogeneous populations of patients with angina, despite angiographically normal coronary arteries, with CMVD showing a predictive value for combined cardiovascular end-points. Management of primary MVA can be challenging but pharmacological and non-pharmacological treatments exist that help improve symptoms in a large proportion of patients affected by MVA. Further research is required in areas such as non-invasive assessment of coronary microcirculation, pain perception abnormalities and pharmacological treatments aimed to target specific pathogenic mechanisms. Patel MR, Peterson ED, Dai D, et al. Low diagnostic yield of elective coronary angiography. N Engl J Med 2010;362:886–95. Lanza GA, Crea F. Acute coronary syndromes without obstructive coronary atherosclerosis: the tiles of a complex puzzle. Circ Cardiovasc Interv 2014;7:278–81. Lanza GA, Crea F. Primary coronary microvascular dysfunction: clinical presentation, pathophysiology, and management. Circulation 2010;121:2317–25. Ong P, Camici PG, Beltrame JF, et al; Coronary Vasomotion Disorders International Study Group (COVADIS). International standardization of diagnostic criteria for microvascular angina. Int J Cardiol 2018;259:56. Cavusoglu Y, Entok E, Timuralp B, et al. Regional distribution and extent of perfusion abnormalities, and the lung to heart uptake ratios during exercise thallium-201 SPECT imaging in patients with cardiac syndrome X. Can J Cardiol 2005;21:57–62. Nihoyannopoulos P, Kaski JC, Crake T, Maseri A. Absence of myocardial dysfunction during stress in patients with syndrome X. J Am Coll Cardiol 1991;18:1463–70. Maseri A, Crea F, Kaski JC, Crake T. Mechanisms of angina pectoris in syndrome X. J Am Coll Cardiol 1991;17:499–506. Di Franco A, Milo M, Laurito M, et al. Comparisons of clinical and angina characteristics between patients with cardiac syndrome X and patients with coronary artery disease. It J Practice Cardiol 2012;1:15–21 www.ancecardio.it. Kaski JC, Rosano GMC, Collins P, et al. Cardiac syndrome X: clinical characteristics and left ventricular function: long-term follow-up study. J Am Coll Cardiol 1995;25:807–814. Lamendola P, Lanza GA, Spinelli A, et al.Long-term prognosis of patients with cardiac syndrome X. Int J Cardiol 2010;140:197–9. Kaski JC. Cardiac syndrome X in women: the role of oestrogen deficiency. Heart 2006;92(suppl 3):5–9. Lanza GA. Angina pectoris and myocardial ischemia in the absence of obstructive coronary artery disease: role of diagnostic tests. Curr Cardiol Rep 2016;18:15. Michelsen MM, Pena A, Mygind ND, et al. Coronary microvascular dysfunction and myocardial contractile reserve in women with angina and no obstructive coronary artery disease. Echocardiography 2018;35:196–203. Lanza GA, Camici PG, Galiuto L, et al; Gruppo di Studio di Fisiopatologia Coronarica e Microcircolazione, Società Italiana di Cardiologia. 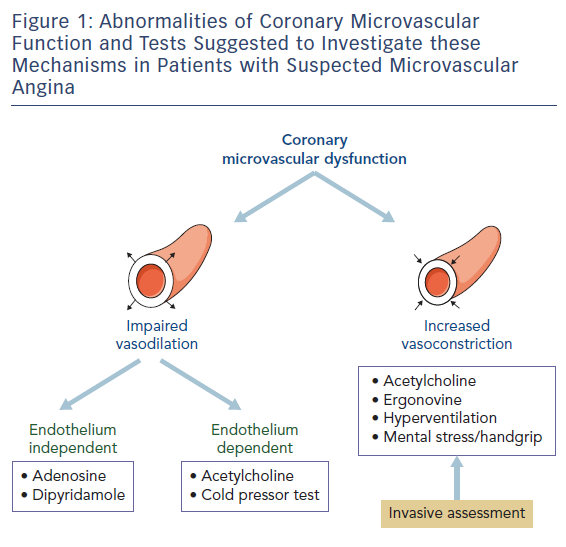 Methods to investigate coronary microvascular function in clinical practice. J Cardiovasc Med (Hagerstown) 2013; 14:1–18. Bøttcher M, Bøtker HE, Sonne H, et al. Endothelium dependent and independent perfusion reserve and the effect of L-arginine on myocardial perfusion in patients with syndrome X. Circulation 1999;99:1795–1801. Panting JR, Gatehouse PD, Yang GZ, et al. Abnormal subendocardial perfusion in cardiac syndrome X detected by cardiovascular magnetic resonance imaging. N Engl J Med 2002;346:1948–1953. Lanza GA, Buffon A, Sestito A, et al. Relation between stress induced myocardial perfusion defects on cardiovascular magnetic resonance and coronary microvascular dysfunction in patients with cardiac syndrome X. J Am Coll Cardiol 2008; 51:466–72. Galiuto L, Sestito A, Barchetta S, et al. Noninvasive evaluation of flow reserve in the left anterior descending coronary artery in patients with cardiac syndrome X. Am J Cardiol 2007;99:1378–83. Ong P, Athanasiadis A, Borgulya G, et al. Clinical usefulness, angiographic characteristics, and safety evaluation of intracoronary acetylcholine provocation testing among 921 consecutive white patients with unobstructed coronary arteries. Circulation 2014;129:1723–30. Opherk D, Zebe H, Weihe E, et al. Reduced coronary dilator capacity and ultrastructural changes of the myocardium in patients with angina pectoris but normal coronary arteriograms. Circulation 1981;63:817–25. Richardson PJ, Livesley B, Oram S, et al. Angina pectoris with normal coronary arteries: transvenous myocardial biopsy in diagnosis. Lancet 1974;2:677–80. Cannon RO 3rd, Watson RM, Rosing DR, Epstein SE. Angina caused by reduced vasodilator reserve of the small coronary arteries. J Am Coll Cardiol 1983;1:1359–73. Motz W, Vogt M, Rabenau O, et al. Evidence of endothelial dysfunction in coronary resistance vessels in patients with angina pectoris and normal coronary angiograms. Am J Cardiol 1991;68:996–1003. Chauhan A, Mullins PA, Taylor M, et al. Both endothelium-dependent and endothelium-independent function is impaired in patients with angina pectoris and normal coronary angiograms. Eur Heart J 1997;18:60–8. Cannon RO, Epstein SE. ‘Microvascular angina’ as a cause of chest pain with angiographically normal coronary arteries. Am J Cardiol 1988;61:1338–43. Egashira K, Inou T, Hirooka Y, et al. Evidence of impaired endothelium-dependent coronary vasodilatation in patients with angina pectoris and normal coronary angiograms. N Engl J Med 1993;328:1659–64. Chauhan A, Mullins PA, Taylor G, et al. Effect of hyperventilation and mental stress on coronary blood flow in syndrome X. Br Heart J 1993;69:516–24. Bortone AS, Hess OM, Eberli FR, et al. Abnormal coronary vasomotion during exercise in patients with normal coronary arteries and reduced coronary flow reserve. Circulation 1989;79:516–527. Fragasso G, Chierchia SL, Arioli F, et al. Coronary slow-flow causing transient myocardial hypoperfusion in patients with cardiac syndrome X: long-term clinical and functional prognosis. Int J Cardiol 2009;137:137–44. Lanza GA, Luscher TF, Pasceri V, et al. Effects of atrial pacing on arterial and coronary sinus endothelin-1 levels in syndrome X. Am J Cardiol 1999;84:1187–91. Wessel TR, Arant CB, McGorray SP, et al; NHLBI Women’s Ischemia Syndrome Evaluation (WISE). Coronary microvascular reactivity is only partially predicted by atherosclerosis risk factors or coronary artery disease in women evaluated for suspected ischemia: results from the NHLBI Women’s Ischemia Syndrome Evaluation (WISE). Clin Cardiol 2007;30:69–74. Lanza GA, Giordano AG, Pristipino C, et al. Abnormal cardiac adrenergic nerve function in patients with syndrome X detected by [123I]meta-iodo-benzylguanidine myocardial scintigraphy. Circulation 1997;96:821–6. Arroyo-Espliguero R, Mollichelli N, Avanzas P, et al. Chronic inflammation and increased arterial stiffness in patients with cardiac syndrome X. Eur Heart J. 2003;24:2006–11. Lanza GA, Filice M, De Vita A, et al. Primary stable microvascular angina: a long-term clinical follow-up study. Circulation 2017;135:1982–84. Pepine CJ, Anderson RD, Sharaf BL, et al. Coronary microvascular reactivity to adenosine predicts adverse outcome in women evaluated for suspected ischemia results from the National Heart, Lung and Blood Institute WISE (Women’s Ischemia Syndrome Evaluation) study. J Am Coll Cardiol 2010;55:2825–32. Lanza GA, Colonna G, Pasceri V, Maseri A. Atenolol versus amlodipine versus isosorbide5-mononitrate on anginal symptoms in syndrome X. Am J Cardiol 1999;84:854–6. Villano A, Di Franco A, Nerla R, et al. Effects of ivabradine and ranolazine in patients with microvascular angina pectoris. Am J Cardiol 2013;112:8–13. Emdin M, Picano E, Lattanzi F, L’Abbate A. Improved exercise capacity with acute aminophylline administration in patients with syndrome X. J Am Coll Cardiol 1989;14:1450–3. Kaski JC, Rosano G, Gavrielides S, Chen L. Effects of angiotensin converting enzyme inhibition on exercise-induced angina and ST segment depression in patients with microvascular angina. J Am Coll Cardiol 1994;23:652–7. Botker HE, Sonne HS, Schmitz O, Nielsen TT. Effects of doxazosin on exercise-induced angina pectoris, ST-segment depression, and insulin sensitivity in patients with syndrome X. Am J Cardiol 1998;82:1352–1356. Fabian E, Varga A, Picano E, et al. Effect of simvastatin on endothelial function in cardiac syndrome X patients. Am J Cardiol 2004;94:652–5. Cannon RO, Quyyumi AA, Mincemoyer R, et al. Imipramine in patients with chest pain despite normal coronary angiograms. N Engl J Med 1994;330:1411–7. Sgueglia GA, Sestito A, Spinelli A, et al. Long-term follow-up of patients with cardiac syndrome X treated by spinal cord stimulation. Heart 2007;93:591–7. Kronhaus KD, Lawson WE. Enhanced external counterpulsation is an effective treatment for Syndrome X. Int J Cardiol 2009; 135:256–7.